Quintess, LRW has arranged $125 million in financing for new home development. This will allow the Club to develop more than 30 new residences, which will become available to members over the next several years. The club plans to move more in to developing its own custom designed properties rather than buying pre existing homes for its members. The clubs portfolio currently consists of 55 homes worth nearly $200 million and available exclusively to members. They expect to grow the real estate portfolio to approximately $500 million by the end of 2008, guided by members priorities for new home locations. 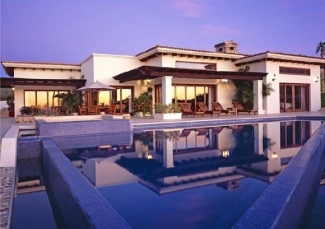 More homes will be added in the current destinations of Aspen, Cabo san Lucas (pictured right), Florence, Hawaii, London, Napa, New York and Paris, and the club will also expand to new destinations like Bermuda, the Greek Islands, Tuscany and San Francisco. Ultimate Resort raised $100m to buy Tanner & Haley. BelleHavens raised money from Hunt Realty and Sentry Financial. Exclusive Resorts raised $72m from Perry Capital. As part of your due diligence in joining a club be sure to check where your initial membership money stands in relation to the capital from investors and founders. You want to be sure that your money is fully secured and ranks ahead of investor and founder financing. Our 60 page Destination Clubs - A Guide for Prospective Members includes a list of due diligence questions.